Welcome to the November issue! I’ve been fielding a lot of calls from potential clients lately, and with every call comes questions about pricing. So I decided to address the issue of cost in this month’s e-Newsletter. I had just begun editing my latest video biography project on a recent morning when the phone rang. I looped my headset over my right ear and hit the “talk” button. “Hello, Family Legacy Video,” I said. He explained that he’d just started to research costs for a personal legacy video he wanted to create in order to share his life stories with his family, but was feeling like a “deer in the headlights” in reaction to the prices he was being quoted. I told him that, yes, budgets for video biographies do fall in the thousands, and not hundreds, of dollars, and gave him a brief explanation as to why. So when we hung up he was certainly better informed, although I’m sure still disappointed at the cost. His reaction was pretty common. Most folks have no idea what it takes to produce a professional, high-quality video; thanks to the proliferation of affordable consumer video gear over the years, many people have gotten the impression that creating video is cheap. Well, it ain’t. And I thought I’d devote a few words in this article to describing why it’s not unusual for simple video biographies to start around $7,500 and prices for higher-end, documentary-style legacy videos to begin between $20,000 and $30,000 and to go even higher from there. Hour-long documentaries produced for outlets like the National Geographic and Discovery channels have budgets ranging from $125,000 on up. A single segment on 60 Minutes can cost $200,000. Family Legacy Video’s personal video biographies rival those network productions in quality and usually run longer than an hour – sometimes much longer. So even if a legacy video clocks in at $40,000, that’s a pretty good deal compared to what those broadcast and cable productions cost. Not everybody can afford these prices, of course. But for those who can, it’s a great, great value. Producers with years of expertise organizing and planning video biography projects. Skilled interviewers and seasoned and creative video editors. Experienced camera operators and lighting directors, audio technicians, and makeup artists devoted to making you look and sound your very best on screen. 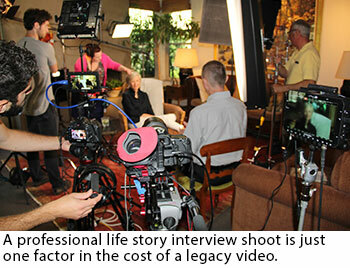 Family Legacy Video® crew members are talented professionals who need to be compensated accordingly. So people are on thing – gear is another. Professional cameras, lenses, lighting and audio equipment in our experienced hands yields fantastic results – but cost much more than consumer gear to purchase and maintain. And then there’s travel. While Family Legacy Video® is based in Tucson, a large chunk of our productions are shot outside Arizona. I’ve traveled to the east and west coasts, points between, even points beyond, like Hawaii. Travel incurs expenses like airfare, car rental, hotel rooms, meals, etc. It’s only fair to include these costs on top of the production expense – if not, Family Legacy Video® could easily lose tons of money on each video. And yet, a lot of prospective clients seem to think this is somehow unfair, or they just want to save money by trying to find someone local to them, or they just don’t like the idea of paying for someone else’s travel expenses, as if our crew is taking a vacation at the client’s expense. Just to be clear, we travel as economically as possible, meaning we squeeze into coach airplane seats, we stay in moderately-priced hotels, and we don’t raid the mini-bars. Finally, custom legacy videos are time-consuming efforts that can easily run into the hundreds of hours. So do I wish everyone could afford Family Legacy Video’s services? Boy howdy, I sure as heck do. But the company needs to price productions at a level that compensates us fairly and allows us to stay in business. Whether you can afford to hire Family Legacy Video® or you opt to do it yourself, the key is not to wait – get started on your video biography now!